1,500 unsharpened standard No. 2 pencils laid end to end stretches just about 938 feet, or just over two and a half football fields. 1,500 pounds of tater tots — a standard of elementary school lunches every where — is about 70,200 tots, enough to feed more than 7,500 elementary school children. 1,500 one-inch three-ring binders (that’s 4,500 rings) can hold 262,500 sheets of homework, note paper and classtime doodles. At the University of Idaho Foundation, 1,500 goes a bit further — that’s the number of fully funded endowments now supporting students, faculty, research and programs at Idaho’s land-grant institution. That 1,500 amounts to more than $10.2 million in scholarship and program support distributed each year — and $165 million distributed since 1959. Like Shirley, many loyal Vandals choose to leave a gift to UI in their will. As a result, an impressive 34% of endowment gifts come from estates. The credit for that milestone number goes to the late Shirley A. (Williamson) Wentz — a lifelong Vandal supporter and dedicated educator — whose gift to the College of Education created the 1,500th endowment for UI’s charitable giving organization. Originally from Caldwell, Wentz earned her bachelor’s degree in education from UI in 1971 and dedicated her career to educating young minds in the Mountain Home and Boise school districts as an elementary and kindergarten teacher. Wentz’s devotion to her students went beyond their time in her classroom; parents and former students often kept in touch with her over the years. She had a reputation for teaching with energy, love and excitement, and encouraged many student teachers in her classroom. Wentz passed away in Caldwell in May 2015 at age 66. “Shirley had a smile that was contagious, and the most incredible blue eyes, which would sparkle whenever she spoke of her children, family, friends and students,” her family wrote in her obituary. Wentz was married to Bill Wentz for 21 years and the couple had two children, Brian and Amy, and seven grandchildren. Wentz created a permanent legacy of her devotion to education with a $25,000 gift to the UI Foundation to create the Shirley A. Wentz Education Scholarship Endowment. Her legacy supports future elementary education teachers from Ada and Canyon counties in Idaho. Her wish was to help future educators so they too might enjoy the rewards she received from introducing young readers to the power of books and reading. Shirley A. 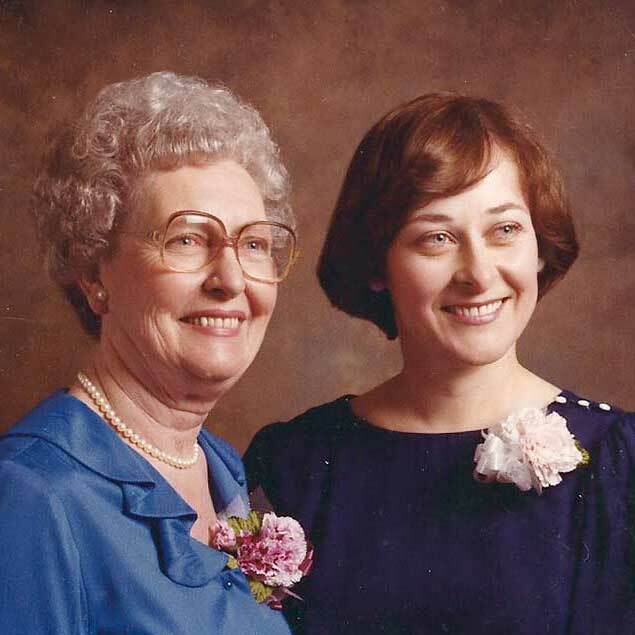 (Williamson) Wentz, at right, with her mother, Evelyn. Endowments like the one left by Wentz are invested over the long term to support students, faculty, research and university programs, Fisher said. With $300 million in total assets, the UI Foundation is the largest of its kind in the state, and a top performer nationally in portfolio management for educational institutions.